As people start to drift in one by one, I realise that there is no turning back now, my short film Newborn is about to begin. Catering has gone according to plan as hot bacon rolls, porridge, fruit salad, tea and coffee are on offer. Actress Mairead Cumiskey is one of the first to arrive. It’s the first time we’ve met and she’s lovely. She grabs her breakfast and snuggles up on the sofa with her script in hand. I brief her before greeting all of the other camera crew who have suddenly arrived. My Gaffer, Solomon, is keen to go through the house and perform the necessary PAT testing which he does almost immediately after he arrives. He’s stern and meticulous and I can tell that he’s got a handle on the lighting front. Spark Manuel joins him and they make a start on setting up the HMI outside. Next I go through the kit with DOP Louis as we decipher the rig and the steadicam. I’m told to go and have breakfast whilst he arranges the kit. I guess I’m so used to arranging and fixing kit together myself that it’s a luxury not to have to do it. It’s not long before I’m told that we’ll soon be ready to shoot. I can hardly eat, I ensure that the monitor is set up and make last minute changes to the set I prepared days before. Digpal Rathore (Rathore Photography) helps me arrange the table to make it look more interesting and then takes photos for continuity. 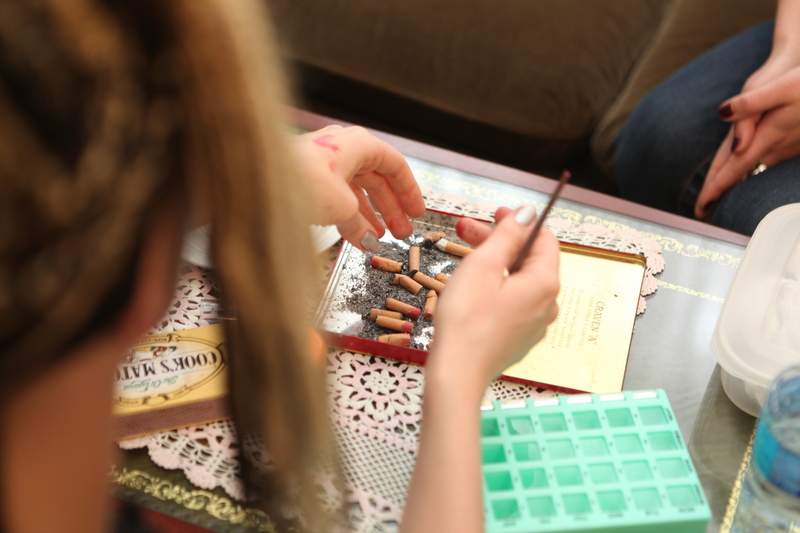 Sammm delivers the remaining props, including a cigarette tin full of used ‘fag’ ends and homemade fake ash that smells like baby power mixed with tobacco. Hot out of make-up and Mairead strolls onto the set. She has morphed into character Marris and looks like a starlet with her mysterious features and gorgeous big brown eyes. The camera loves her and the light favours her magnificently. We get the smoke machine working and Solomon fans the settling mist with a flag arm. I prep Mairead but she doesn’t seem to need much guidance as she sits practicing before the take. She takes direction well along with last minute changes. 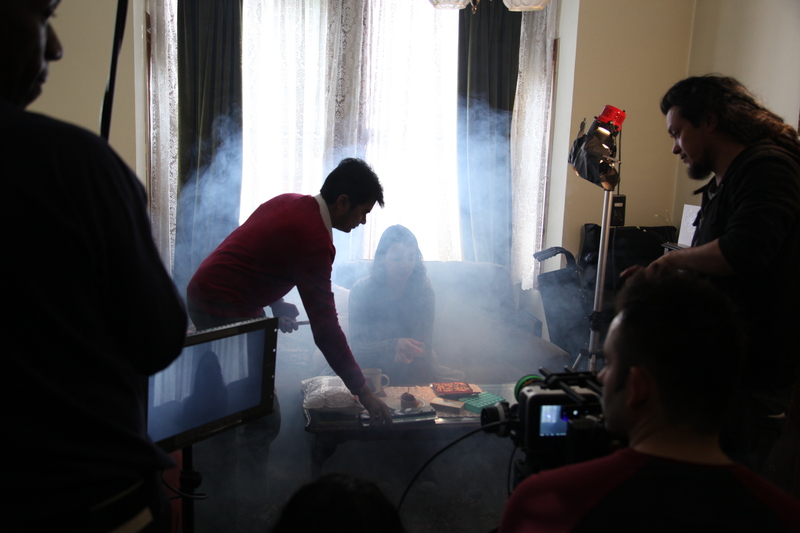 The smoke has settled and we’re finally ready for a take. I have my shots in front of me and we work our way through the list. It’s gruelling work as the set hardly changes throughout the day until the night shoot scheduled at 7pm. 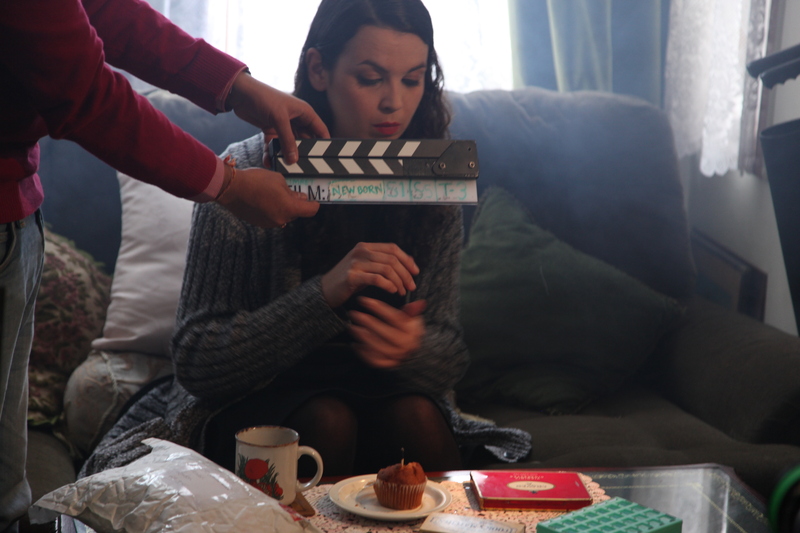 The shots appear to be quite general – a lot of She takes a match, lights it and sticks it into a cupcake. However they are actions that are fundamental to driving the story forward. Although we’re working through the shot list at a reasonable speed, I can see that keeping an eye on continuity and arranging props at every take could possibly delay the shoot. Luckily Digpal doubles up as my Art Department/Continuity as we struggle to place things back onto the coffee table in the exact order. Yes, it appears that I’ve overlooked the importance of having an Art Department available at all times…and a First AD for time management. At lunch Louis takes me to the side and asks whether I can source a First AD, so that I’m not doing everything. I know that I’ll have one for the Saturday but unfortunately my First AD couldn’t make the first day of the shoot, so I took it on his role, something I now regret. Getting another at the last minute will be a challenge. Helps arrives as Sammm Agnew posts an advert on her Facebook page and through a diary service. But finding a First AD for expenses only at short notice is a big ask. It doesn’t happen and I’m left to carry on playing First AD in addition to my role as director. It’s tough. Solomon steps in. ‘I work as a First AD sometimes and this is what you need to do…’ Solomon goes onto explain. 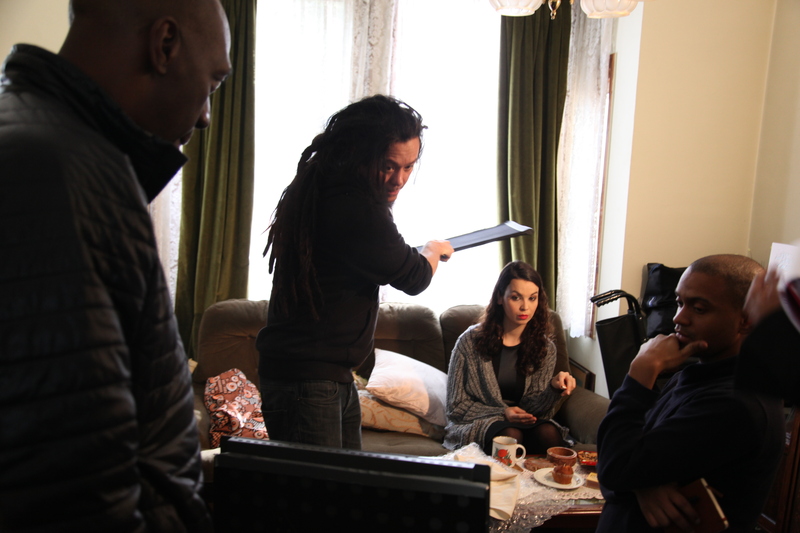 He’s an all rounder, Gaffer, Camera Operator and…First AD. He advises me on what to do, occasionally butting in (it’s for the good of the shoot and his well-travelled Kiwi spirit is a great help). 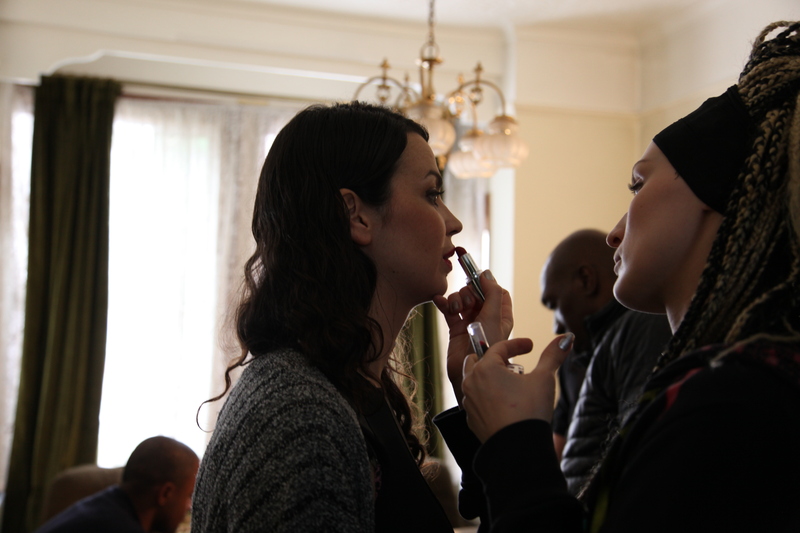 Before long we’re battling through the shots again with a proactive workflow. We’re two hours behind schedule. Mairead has a dress change and we carefully go through the evening scene. Unfortunately there is minimal access for the wide shot we’d planned. The room is an awkward size and the crop on the Black Magic Camera doesn’t help. We figure out the best way to shoot the opening to the scene. We need some form of a wide and Louis crams himself into the corner of the room and follows Mairead with a pan shot. Solomon also attempts the shot. It works and it’s the only way to get what we need. 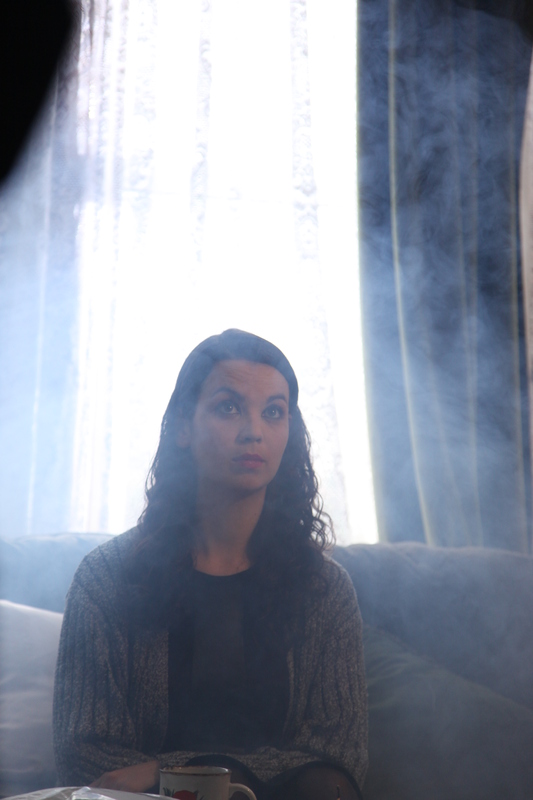 The lighting is low key and atmospheric, the haze from the smoke machine lends a richness to the image. It’s cosy and reminiscent of a 1930’s movie. As simple as it appears in the script, it’s one of my favourite scenes. The reflections in the mirror and the brushing of character Marris’s hair is orgasmic and I flush in excitement for the POV hairbrush shot I so desperately wanted. ‘It’s certainly different…and strange,’ Solomon says. Louis chuckles as he probably remembers my re-enactment of the brush. Yes I’ve played a brush, a marble bowl and many other items to portray my ideas. I even moved my body as if I was the motion of the camera during pre-production meetings. Thankfully Louis humoured my attempts. It’s after 11pm and two hours past our estimated wrap. It’s time to wind down. Tomorrow is a big day as Sammm will spend 6 or more hours painting and moulding the monster onto actor Christopher Clark. 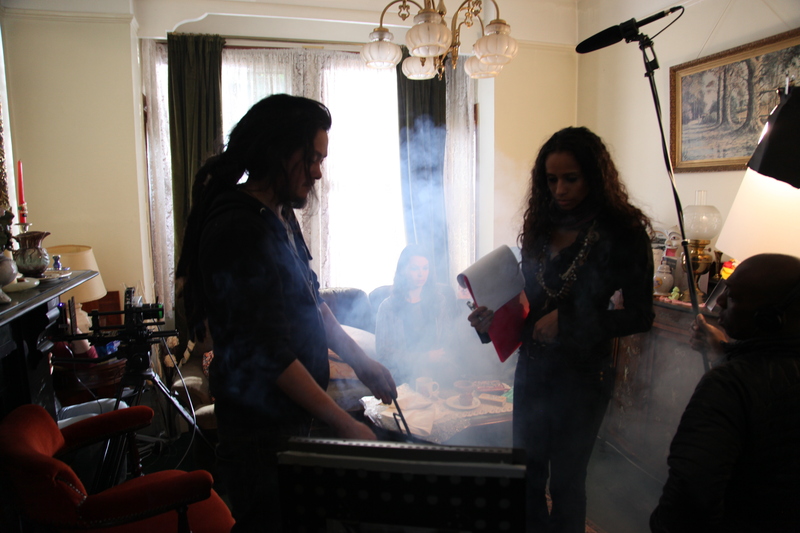 There are also dialogue scenes with Lucy Stylianou and Charlie Cheswick who has come all the way from the Midlands. 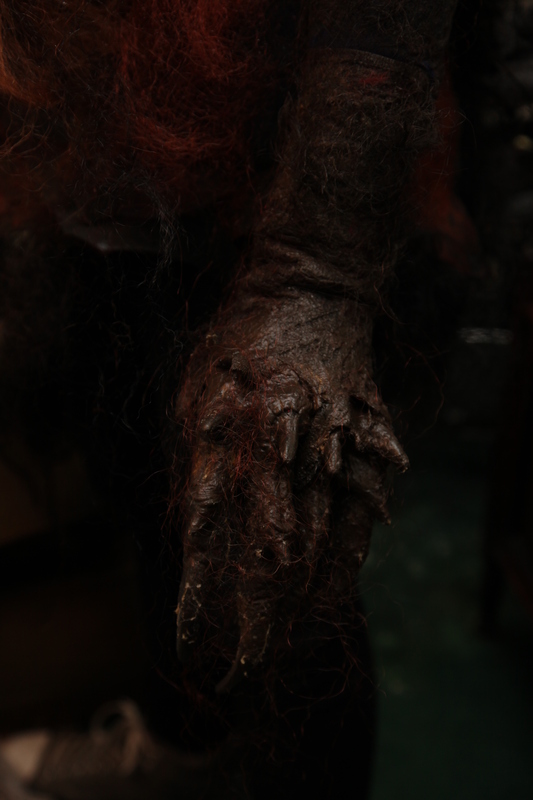 Then of course the big monster scene – a night shoot scheduled to finish at around midnight. Please keep reading to see what day 2 brings! hey s-gal! u r much better than i even thought in my wildest dreams…..